Douglas Burke is a USC physics professor, director, writer, and actor whose first movie, Surfer: Teen Confronts Fear, is bizarre, heartfelt, and sort of amazing in a way (check out my review of the movie here). In this interview, Burke talks with this writer about making Surfer: Teen Confronts Fear, what the movie is actually about, and more. Bryan Kristopowitz: How did you come up with the idea for Surfer: Teen Confronts Fear? Douglas Burke: I was filming my son surfing from age 5 to 14 and was imagining a silent movie that showed his progression and told a story. I was constantly writing the script for the silent movie as the footage I collected began to tell a story. Then at age 13 when he rode some really big waves I changed the story because his surfing accomplishments deserved to be presented in a dramatic feature with full dialogue and sound. BK: Did you always intend to star and direct? DB: There was never any alternative because it would have taken too much time and money to explain my vision to an actor and a director. It is natural for a poet to act out his own plays. Thespis, according to Aristotle, was the first actor to appear on a stage portraying a character. Thespis also acted in the plays that he wrote. It is a tradition for poets to be actors in their own works. The name Thespis is the origin of the word Thespian. BK: What, exactly, is Surfer: Teen Confronts Fear supposed to be about? I’m not afraid to say that I was confused by a large chunk of it. DB: A young 13-year-old boy Surfer is crippled by fear of big waves, and is visited by a spirit ghost version of his Father whom he never met in real life. The Father teaches him how to overcome the fear. 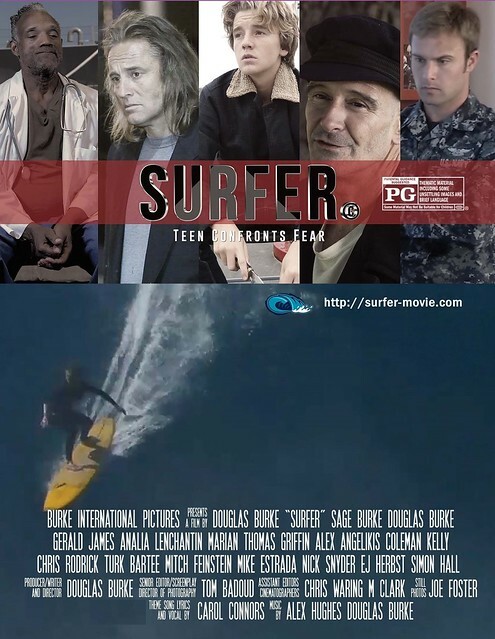 BK: How long did it take to make Surfer: Teen Confronts Fear, from finishing the script to completing post-production? DB: The script was all just my notes from watching my son’s surfing and that spanned 9 years. Then it took another year to plan and film all the scenes with other actors. Then an additional year of post-production. BK: Was there anything cut from the movie that you originally shot? DB: Lots of surf footage and some supporting subplot scenes. BK: Where was Surfer: Teen Confronts Fear filmed? And where were the surfing sequences filmed? DB: The dialogue scenes were shot along the beaches of southern California and in the city of West Hollywood. The surf footage was shot in Newport Beach CA , Huntington Beach CA, San Clemente CA, Half Moon Bay CA, Uluwatu BALI Indonesia, Puerto Escondido Mexico, Desert Point Lombok Indonesia, Wedge Newport Beach CA, and Todos Santos Island Mexico. BK: What is all of the “black ops/Navy SEAL” stuff about? DB: Inverse arrow of time within the real time plot revealing of the background of the Father’s character. BK: And what’s the deal with all of the scenes of bait cutting? DB: The Father has the answers for the Son. The Father is put together out of Squid and electricity. When the son is cutting up bait it is a metaphor for cutting up the very thing that you need to get all the answers and get out of the plight you are in. It is a visual representation of the tragic flaw within the character of the Son. BK: Why was the title changed from Surfer to Surfer: Teen Confronts Fear? DB: The phrase “Teen Confronts Fear” was put as a tagline on the posters to promote the movie. It seemed to stick so now it goes by either title. BK: Explain, if you could, the mystery of the Coke bottle that was knocked over and spilled everywhere in one scene and then was back, intact, in the next? DB: I was directing the scene in an improvisational way and the actor’s instinct was to give the young boy a Coke to calm him down. So the infamous Coke bottle scene was born. It is supposed to be a lapse of time and the fresh Coke is there because some time has lapsed. BK: Any future filmmaking plans? Will we ever see a Surfer 2? DB: I have a story for a sequel to Surfer but I have no production plan. I have to focus on the distribution of Surfer: Teen Confronts Fear for now. I have a second film done but needs a score. A third film is half done. BK: How will people be able to experience Surfer: Teen Confronts Fear? Will there eventually be a DVD or Blu-ray? DB: Surfer will be available in all of the alternative formats in late 2019. BK: Please explain what “hard jelly” is. We’d love to know. DB: The simplest multicellular organisms are single cells embedded in a jelly of protein and polysaccharide called the extracellular matrix. When we evolved from single cells, cells started to hang together in a type of jelly. In the story of Surfer, the ghost of the Father must materialize into a physical presence to talk to the son the raw materials in the ocean that would provide the jelly matrix to appear as a multi-celled organism would be the squid meat. The jelly substance symbolizes the coming together of cells for the single purpose of evolving life to help the spirit within become more physical. The jelly the Father materializes as symbolizes the coming together of the many pieces of the Father’s spirit for the single purpose of manifesting physically to help his son. When the jelly hardens it is fully manifested as a multi-celled organism that speaks to the son. The audience doesn’t have to know all of this but the cells in their body have a cellular memory of it. This causes a very physical reaction in their body that they actually enjoy. The people who don’t like it are just not comfortable when a lot of energy is flowing in their body. Ask anyone who has seen the movie and they will have something to say about the squid meat, the hard jelly, or the squid ink my character regurgitates. It all generates primitive subconscious emotions in the audience that most enjoy as fun. The cells in our bodies have a memory of when we all first became multi-cellular in a type of gel. Memory that is subconscious is the best kind of memory. There is some DNA evidence now that suggests that we evolved from jellyfish. Another interesting piece of science is that humans and squid evolved to have the same eyes. The eyes are the windows to the soul. There is some connection we have to squid as well as jellyfish. Anyways whether the references in Surfer are provoking primitive memories of us being in the ocean or not there are plenty of people who say they will never forget Surfer: Teen Confronts Fear. A very special thanks to Douglas Burke for agreeing to participate in this interview and to david j. moore for setting it up. Check out the official Surfer: Teen Confronts Fear website here.